There is an issue of conflict over the usage of our forest—some people are interested in the flora-grass, flowers and natural ecosystem and other like to pan gold and mineral specimens. Their differing visions have now brought them into conflict over a Forest Service proposal to ban new mining claims at 11 sites totaling 17,487 acres. While the proposal, known as a mineral withdrawal, covers only about 2 percent of the Black Hills National Forest's total area, amateur prospectors contend that the targeted sites contain more than half of the promising mining areas that remain unclaimed in the Black Hills. Some think the proposal is part of a broader effort by the Forest Service and other federal agencies to restrict access to public land. Their competing opinions about the mining ban will ultimately be weighed by the U.S. secretary of interior, who is tentatively scheduled to decide the proposal’s fate by the end of September 2016 . * We still have two weeks to call or write letters. Written public comments on the proposal will be accepted to the Forest supervisor, Black Hills National Forest, 1019 N. Fifth St., Custer, SD, 57730. Note—If someone is interested in replacing Jan on these two positions for the next year beginning November 2016-17-retiring due to illness and many years of devotion to keeping our "used to be " public lands free to hunt on. The FS has closed thousands of acres where our main trails used to be, by stating "due to Ferret habitat" that some of us cannot hike miles to our favorite rock beds. Let your WDG&M officers know that you are interested!. Duties including looking for any type of Forest Service management closures monthly- (example: Blue Ribbon coalition webesite, etc,) especially concerns of our Buffalo Gap Grasslands, Black Hills forest, write up articles, send copies to WDG&M bulletin editor, officers, club members and Chairman of both RMFM PLAC and ALAA, to Tom Troxel-and WDG&M Multiple Use Coalition Representative. *I am sending this to all because of the proposed date by US Secretary of Interior. My correct email is: jb-rockhound@hotmail.com. SOUTH DAKOTA PUBLIC LAND NEWS- by Jan Baumeister, SD Rep.-Rocky Mountain Federation Mineralogy Society (12 states) -Public Lands Activity Committee; and Western Dakota Gem and Mineral Society, Rapid City, SD. 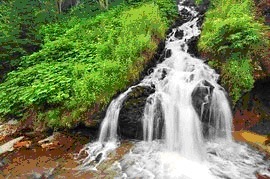 SD Governor Daugaard and a "Spearfish Canyon Foundation" are planning to "donate" land to the state Department of Game, Fish and Parks after purchase 72 acres in Spearfish Canyon, including the scenic Spearfish Falls. The land is adjacent to two state-owned parcels including Rough Lock Falls Nature area. Then additional land for the proposed park, which Governor Daugaard called, "Spearfish Canyon State Park" could come from the federal-state land -1,490 acres of Forest Service land exchange that Governor Daugaard said is being pursued at the federal level by US Senator John Thune, R-SD. He stated that the area as a state park would result in improved opportunities for camping, hiking, fishing and sightseeing. Once a State park, excessive fees can be charged for each activity listed as well as restriction as no gold panning, and rock hunting! 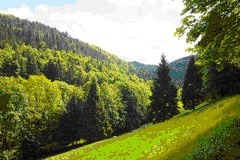 All activities, under the present ownership and the National Forest have been free. 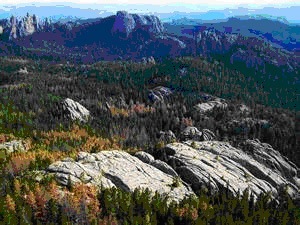 Example of State owned land: There are beautiful fortificated banded agates in Custer State Park, but hunting is prohibited so will never be any rock hunting in the Spearfish Canyonlands in future State parks. Continued report: Rapid City Journal, January 17, 2016-Seth Tupper, Journal Staff: A Fight at the Falls - A caption under the picture of Roughlock Falls stated: Park Fee possible for Roughlock Falls! Excitement over potential state park is tempered by the assumption that an entry fee will be imposed. South Dakotans have long had free access to the canyon wonders. A state official, a policy adviser to Gov. Daugaard, told the Journal that while Spearfish Canyon State Park is a long way from reality, an entrance fee is a possibililty over the long term. We do not need this proposed State Park! An example of State and National Parks is in this same issue, page E5 under article " Badlands Should Explain Fees"- A headline on the homepage of the Badlands National Park website says "Good Times in the Badlands"- The Park officials want to charge more fees. The proposal calls for raising the walk-In fee from $7.00 to $12.00, the motorcycle rate from $10.00 to $20.00 and vehicle rate from $15.00 to $25. These passes are only good for seven days -to drive on existing highways of #377 and # 240 between Interior and south of Wall, SD. Doesn't the present SD Governor and SD senators in Washington realize people will not be driving thru parks with such outrageous fees, as most tourists go thru these areas in one day, and it will result in loss of revenue for South Dakota! Recently, the City of Sturgis who owns 640 acres of land southwest of the city, is try to sell it to the State for another area of a State Park! State Parks are closing lands for public usage plus adding steep permit fees to doing anything in them. It's all about taking our freedom of using public forest land, the use of roads and trails from the people who support government by taxes. I've contacted both SD Senators and wrote to Governor Daugaard. Governor Daugaard phone is 605-773-3212, you can find our Washington, DC Senator's phone in the Rapid City Journal once a week, or contact their Rapid City offices. I went into their websites and you can put an email message and send it easily. I have also called Governor Daugaard's office and asked if there would be public meetings in the future concerning this proposed State Park and no one bothered to return my phone call! I expected this. If you are concerned, please contact these state and government officials. The South Dakota Field Office (SDFO) manages over 274,000 surface acres and around 1.7 million acres of subsurface mineral estate in South Dakota. The majority of the surface acres are located west of the Missouri River in 13 counties; mineral estate is found in 32 of the 66 counties. Butte County in western South Dakota has the majority of the surface acres with around 145,000 acres. (*Editors note: The map shows there is BLM land in upper Shannon County and upper part of Jackson County, SD and scatter around north and east of the Black Hills. It might pay for rockhounds to get a BLM map for future hunting- it states: recreation (especially hunting) if public access exists. The February 17th issue of the Rapid City Journal , Rapid City, SD has an article stating that one of the branches of the Sierra Club, “Defenders of the Black Hills” are delaying efforts for the National Guard’s plans for troops to train on 800 acres (out of over 100,000 acres) of the Buffalo Gap Grasslands in Western South Dakota The National Guard have picked areas of arid, treeless terrain that would help simulate conditions in Afghanistan and Iraq. The “Defenders” are protesting that radiation levels caused by uranium deposits at or near the surface were “likely” to be harmful to soldiers during training exercises. The B.H. group of Sierra Club challenged the National Guards’ environmental assessment process last year due to impact maneuvers on grassland “ecosystem and wildlife.” They are not one bit concerned about workmen in the uranium field at Edgement, or the hundreds of acres destroyed with deep holes and grass ate to the roots, making the grassland bare on the Buffalo Gap Grasslands. It was the efforts of the National Guard that stopped Senator Johnson’s bill in Congress three years ago to put all of the grasslands along Cheyenne River into “Wilderness. Forest Service’s almost roadless plans closed our trails is now in effect. The elderly has to walk miles or stay home ! Their new efforts now is another plan to get National Guards off these areas! It is all part of the Northern Plains conservation Networks’ great vision plans to get all of the northern plains put into millions of acres into Wilderness for Buffalo Patures. Send comments to Senator Dennis Daugaard, Office of Governor, 500 Capitol Ave, Pierre, SD 5775001 (www.dennis-daugaard.net) USDA Forest Service, Nebraska National Grasslands, Samual McKelvie, 125 No. Main Street, Chadron, NE 69337 and your own state governor, US congressional Senators and Representatives and ask them to support the South Dakota National Guard on this concern. Below Links are provided for reference only and does not imply any support of content or issues by ALAA.